To understand how store functions could be enabled for Code First in EF 6.1 let’s take a look first at how they work in the Database First scenario. In Database First you define methods that are driving the execution of store functions in your context class (typically these methods are generated for you when you create a model from the database). You use these methods in your app by calling them directly or, in case of TVFs, in LINQ queries. One thing that is worth mentioning is that these methods need to follow certain conventions otherwise EF won’t be able to use them. 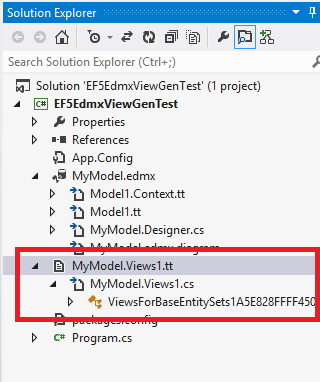 Apart from methods defined in your context class store functions must also be specified in the artifacts describing the model – SSDL, CSDL and MSL (think: edmx). At runtime these artifacts are loaded to MetadataWorkspace object which contains all the information about the model. In Code First the model is being built from the code when the application starts. Types are discovered using reflection and are configured with fluent API in the OnModelCreating method, attributes and/or conventions. The model is then loaded to the MetadataWorkspace (similarly to what happens in the Database First approach) and once this is done both – Code First and Database First operate in the same way. Note that the model becomes read-only after it has been loaded the MetadataWorkspace. in some cases TVF mapping may require additional details – a column name and/or the name of the database schema. You can specify them using the DbFunctionDetailsAttribute. The column name is required if the method is mapped to a TVF that returns a collection of primitive values. This is needed because EF requires providing the name of the column containing the values and there is no way of inferring this information from the code and therefore it has to be provided externally by setting the ResultColumnName property of the DbFunctionDetails attribute to the name of the column returned by the function. The database schema name needs to be specified if the schema of the TVF being mapped is different from the default schema name passed to the convention constructor and can be done by setting the DatabaseSchema property of the DbFunctionDetailsAttribute. The above requirements were mostly about method signatures but the bodies of the methods are important too. For TVFs you create a query using the ObjectContext.CreateQuery method while stored procedures just use ObjectContext.ExecuteFunction method. Below you can find examples for both TVFs and stored procedures (also notice how parameters passed to store functions are created). In addition the methods need to be members of the DbContext derived type which itself is the generic argument of the convention. Currently only the simplest result mapping where names of the columns returned from the database match the names of the names of the properties of the target type (except for mapping to scalar results) is supported. This is actually a limitation in the EF Code First where more complicated mappings would currently be ignored in most cases even though they are valid from the MSL perspective. There is a chance of having more complicated mappings enabled in EF 6.1.1 if appropriate changes are checked in by the time EF 6.1.1 ships. From here there should be just one step to enabling stored procedures returning multiple resultsets in Code First. 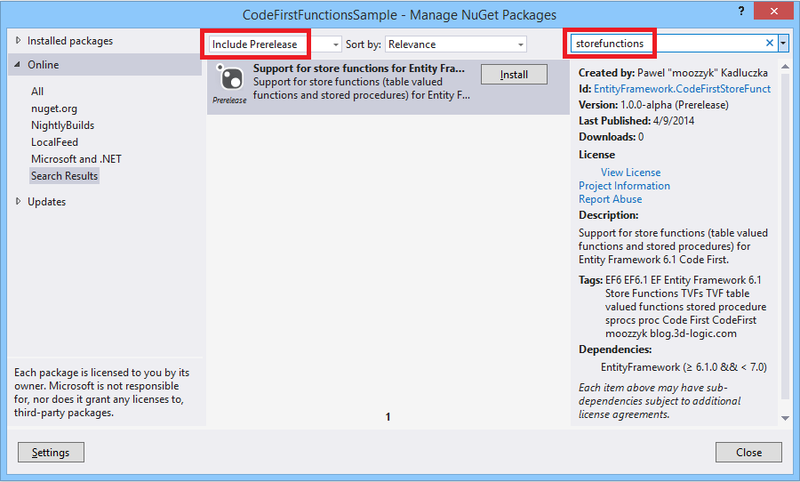 command or using the UI – right click the References in the solution explorer and select “Manage NuGet Packages”, then when the dialog opens make sure that the “Include Prerelease” option in the dropdown at the top of the dialog is selected and use “storefunctions” in the search box to find the package. Finally click the “Install” button to install the package. After the package has been installed copy and paste the code snippet from below to your project. This code demonstrates how to enable store functions in Code First. var zipCodeParameter = zipCode != null ? var nameParameter = name != null ? Note that in both examples the return types are based on entity types. As I hinted above you can also use complex and scalar types for your results. Take a look at the End-to-End tests in the project itself – all scenarios are tested there. If you look at the code there are a few TODOs in the code. One of the most important is the support for nullable parameters. I am also thinking of removing the limitation where the method name in your DbContext derived class must ultimately match the name of the TVF in the database. If the workitem 2192 is resolved for the next version of EF I will be able to add support for non-default mapping. In addition I think it is very close from workitem 2192 to supporting stored procedures returning multiple resultsets. Not sure how useful it would be but it would be cool to see support for this feature which currently is kind of a dead feature because it is supported neither by CodeFirst nor by EF tooling. The project is open source and is hosted on codeplex. You can get the sources from here. Try it and let me know what you think. If you want to enforce re-generating views (e.g. after the edmx file changed) just right click the .tt file and select “Run Custom Tool”. If you need to uninstall the template go to Tools→Extensions and Updates… select the template from the list and click the “Uninstall” button. 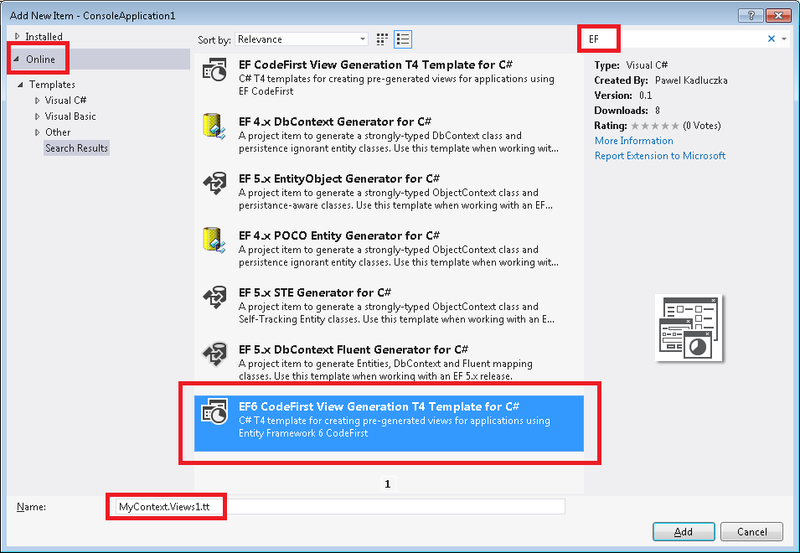 Some time ago I showed how to hack the EF Designer shipped with Visual Studio 2012 to work with EF6. Those hacks should be no longer needed – last week we shipped Entity Framework 6 Beta1 which for the first time contains not only EF6 runtime but also contains tooling. 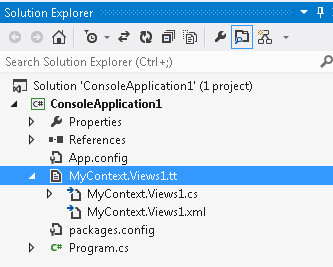 The new EF Designer works with Visual Studio 2012 and replaces the designer that was originally shipped with Visual Studio 2012. Almost all the work we did was about adding support for EF6 – being able to handle new metadata types, using the new provider model, creating EF6 specific T4 templates etc. 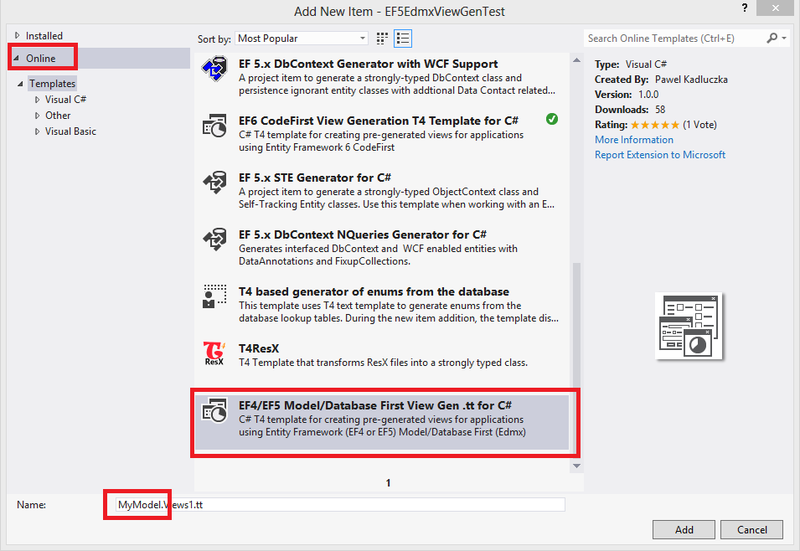 This work has not been completed yet and some scenarios like support for EF6 on .NET Framework 4 or using non-SqlServer (or SqlServerCE) providers when using EF6 are still not enabled but if you want to use model first/database first workflows with EF6 the Beta version is currently your best option. Note that even though this release is mostly about adding support for EF6 we are not abandoning EF5. For EF5 the EF Designer Beta 1 version supports all the scenarios that were supported by the previous versions. 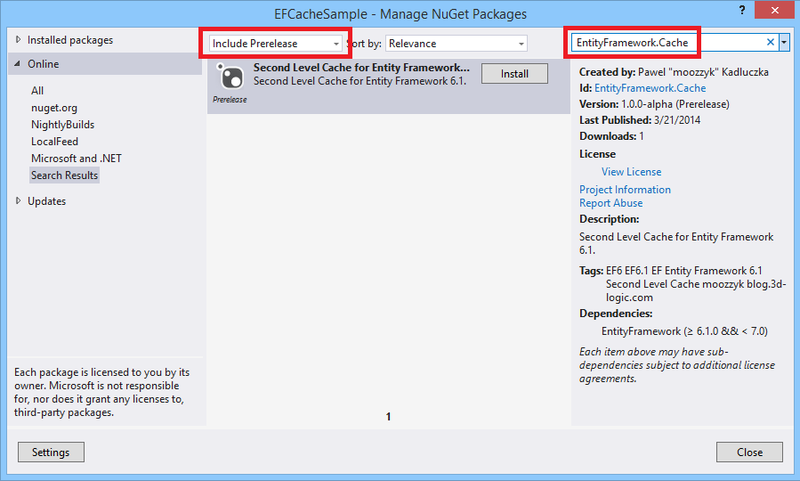 You choose the target version of Entity Framework in the wizard when adding a new model to your project (note that in some cases the choice is limited – e.g. if your project already has a reference to System.Data.Entity.dll you won’t be able to select EF6). EF6 runtime is no longer shipped as part of the .NET Framework and we did not have to do hacks we had to do when shipping tooling in June 2011 CTP. It means that it is easy to install the EF Designer Beta 1 but it is also easy to uninstall it and go back to the original designer shipped with Visual Studio 2012 – just go to Programs and Features, uninstall the new designer and repair Visual Studio and things should work as they did before. Just go to the download center and install the msi. Since the new EF Designer is easy to install and uninstall and it supports all the scenarios supported by the old one I would like to encourage everyone to try it out and let us know about your experience (and issues). This is only a Beta version and we already know it has some rough edges but it may also have bugs we don’t not know about yet. Try it out and if you see something start a new discussion or create a new work item. The version for EF6 RTM is now available. If you need to uninstall the templates go to Tools→Extensions and Updates… select the template from the list and click the “Uninstall” button. That’s pretty much it. Works for me and hopefull will work for you. I am not trying to diminish MSBuild Community Tasks or claim that inline tasks will solve all problems of this world. I am trying to say that for small simple tasks inline tasks can be just much more convenient. I can open the archive I created in the Windows Explorer, browse and open files. No additional metadata files are added to the archive – it’s a POZF™. So – yes, you now can create a multifile zip archives in .NET Framework without using third party libraries. And now creating an inline MSBuild Zip task that fits my new build system is easy. This makes me happy!